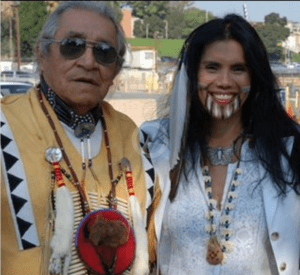 In photo Mayor Antonio R. Villaraigosa, Joanelle Romero founder Red Nation Celebration Institute & American Indian Heritage Month, Montano Rain Red Nation Celebration Institute Board member, Lt. Bustamante State of California. 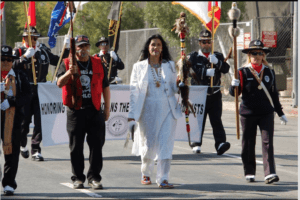 Red Nation Celebration Institute created and founded the American Indian Heritage Month in the City/County of Los Angeles in 2005 and officially recognized in 2006 by the State of California and the City of Los Angeles and in the State of New Mexico 2008. 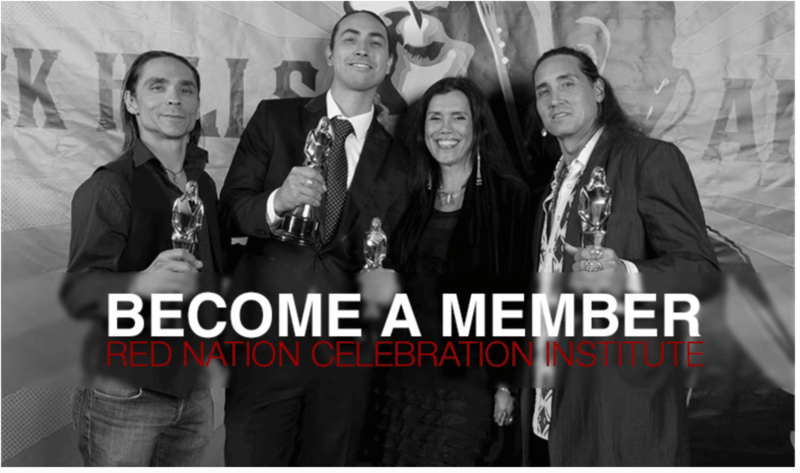 Red Nation Celebration Institute (RNCI) is a pioneer organization and is the longest standing Native Arts & Cultural tax exempt 501c3 nonprofit organization in Los Angeles, est. 1995. RNCI is the first Native Arts & Cultural nonprofit organization to be funded by The City of Los Angeles Cultural Affairs Department in 2000. 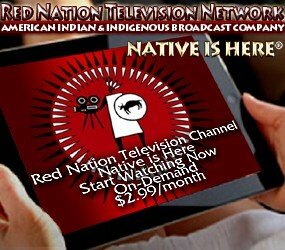 RNCI program, Red Nation Film Festival & Awards established in 2003, is the first Native Film Festival in Los Angeles and is held and is part of American Indian Heritage Month in the City of Los Angeles. Before 2003, there was no venue for Native cinema in the Entertainment Capital of the World – Hollywood. Red Nation Celebration Institute forever changed that making history! NOTE: 2006 City of Los Angeles Mayor’s Reception was produced by Red Nation Celebration Institute. Local Tongva Spiritual Leader Jimi Castillo officially recognized Joanelle Romero as “the First Lady of American Indian Heritage Month” for all Red Nations, due to her vision in founding and estabishing the American Indian Heritage Month in the City of Los Angeles in 2006, in addition because she had succeeded in unifying the interests of 19 tribes in the Los Angeles area. Resolution – WHEREAS, the richness of American culture is deeply rooted in the diverse histories and innumerable accomplishments of American Indians. WHEREAS, American Indians were the first Americans and each American today experiences the legacy of native invention in the crops that feed us, the medicines that cure us and the tools that help us. WHEREAS, American Indians, primarily the Tongva, Chumash, and Tataviam peoples, occupied the Los Angeles region for thousands of years before the coming of outside settlers, and these First People live here still. WHEREAS, the United States and Los Angeles continues to be influenced by the contributions of America’s first peoples to science, art, music, history and our national prosperity. WHEREAS, American Indian history has been a story sometimes of strife, but always of strength. WHEREAS, the United States government on the level of city, state and nation, has not always accorded American Indian Peoples the respect demanded by history and guaranteed by law. 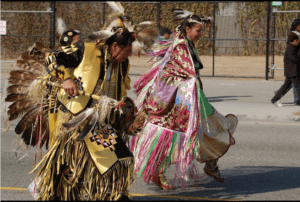 WHEREAS, the federal government first formally designated the month of November as National American Indian Heritage Month in 1990, in a joint resolution authored by Senator John Kerr of Massachusetts and signed by President George H.W. Bush. WHEREAS, Los Angeles is home to the largest urban American Indian population across the nation. WHEREAS, the Los Angeles City/County Native American Indian Commission this year celebrates 30 years of existence in representing the Los Angeles American Indian community. 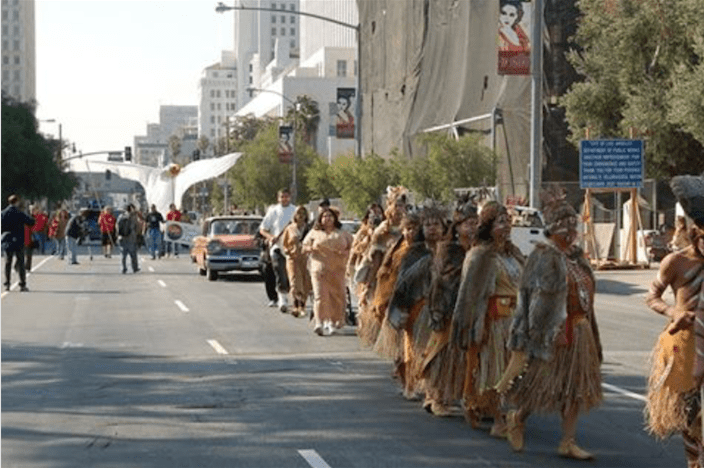 WHEREAS, Los Angeles has been able to preserve and promote it’s rich American Indian culture through the community work of local organizations several of whom are sponsoring events this coming month. WHEREAS, by proclaiming November American Indian Heritage Month we pay special tribute to our American Indian culture. NOW THEREFORE, BE IT RESOLVED, that by adoption of this resolution, the Mayor and Los Angeles City Council, do hereby proclaim the month of November 2006 as “American Indian Heritage Month” in the City of Los Angeles, and further encourage the promotion of continued positive interaction among our residents of all cultural and ethnic backgrounds. AS MAYOR OF THE CITY OF LOS ANGELES AND ON BEHALF OF ITS RESIDENTS, I AM HONORED TO EXTEND MY SINCERE APPRECIATION TO YOU FOR YOUR VISION AND SUPPORT IN MAKING AMERICAN INDIAN HERITAGE MONTH A REALITY. WE RECOGNIZE YOUR LEADERSHIP AND EXTRAORDINARY WORK IN PROMOTING AND PRESERVING AMERICAN INDIAN CULTURE IN THE ARTS AND COMMUNITY; AND FOR YOUR OUTSTANDING CONTINUOUS SUPPORT OF JUSTICE NOT JUST IN THE AMERICAN INDIAN COMMUNITY BUT FOR ALL ANGELENOS AND WOMEN EVERYWHERE. I would like to express my sincere congratulations for partnering with the City of Los Angeles to initiate the First Native American Indigenous Heritage Month in one of the most culturally diverse cities in the world. The Consulate General of Mexico in Los Angeles recognizes the importance of developing activities through which we can have a better understanding of other cultures, praise our similarities and celebrate our traditions and values. Mexico has a historic and cultural background that reflects our indigenous roots and the importance of promoting diversity and tolerance. 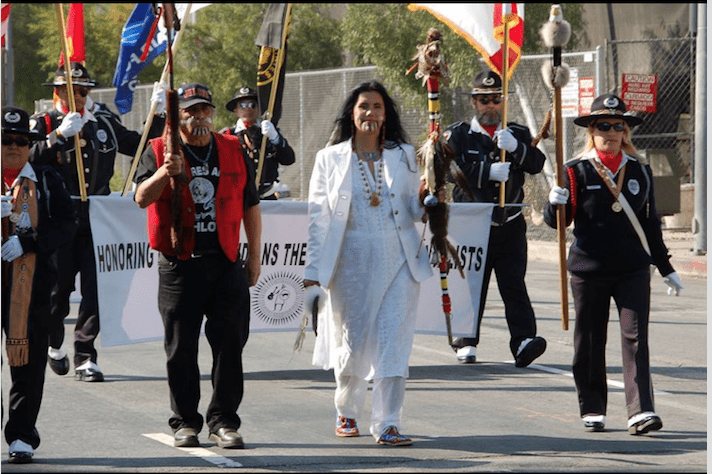 On behalf of the City of Los Angeles, it is my pleasure to welcome and congratulate the Red Nation Celebration and its supporters as we introduce the Indigenous Nations Heritage Month, a long overdue tribute to the organ people of this land; initiated by Red Nation Founder, Joanelle Romero. MOTION That the “Red Nation Pow-Wow” sponsored by the Red Nation on November 10 and 11, 2007 from 10:00am to 8:00pm, be declared a Special Event. (Event Coordinator: Janelle Romero- Phone: 818/904/9256). MOTION That the “Los Angeles Red Nation Pau Wau” sponsored by the Red Nation on November 10, 2007 from 10:00am to 12:00 noon, be declared a Special Event. (Event Coordinator: Bill McCarthy- Phone: 310/425-6134). MOTION That the “Red Nation Celebration Parade” sponsored by the Red Nation on Saturday, November 10, 2007 from 10:00am to 12:00 pm, be declared a Special Event. (Event Coordinator: Janelle Romero- Phone: 818/904/9256). RNCI has received 23 years of Awards, Resolutions, Proclamations, Certificates of Appreciation, Letters of Support, from the City of Los Angeles, State of California, State of New Mexico, Indian Affairs, Native Businesses, Native communities, Spiritual Leaders, Chairwomen/men of different Sovereign Nations, and Congresswomen of the United States in recognizing RNCI as a pioneer Native organization in ground-breaking programs and initiatives.